Our Fraiche wine and cheese hamper includes imported Brie and Camenbert cheeses accompanied with gourmet crackers fresh and juicy bunches of red and green grapes. 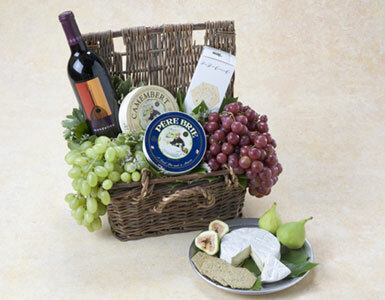 We have many wine and cheese gift ideas including Brie gift basket, Camembert gift basket, wine and food baskets, wine and cheese gourmet baskets, and assorted cheese and wine baskets. These delicate arrangements of wine and cheese gifts must be delivered by hand and are only available for delivery to your home or office in Beverly Hills, West Hollywood, Santa Monica and greater Los Angeles area.